In book three of her Glamourist Histories, WITHOUT A SUMMER, Jane and her husband, Vincent, are still dealing with the fallout from the events of GLAMOUR IN GLASS. Jane’s actions in breaking her husband out of a French prison via the use of glamour caused her to suffer a miscarriage. She and Vincent are still mourning, but they’ve thrown their pain into new and better works of glamour; that they have the attention of the Prince Regent due to Vincent’s military heroism and their own talents has made Vincent’s estranged father, Lord Verbury, try to horn back into their lives. Not that he’s likely to do so, as Jane and Vincent distrust Verbury for very good reasons . . . but I digress. As you might expect if you have any knowledge of history dealing with the early 19th Century, WITHOUT A SUMMER takes place during 1816 — the year Europe and much of the world did not have a summer at all. There was hardship, famine, and many difficulties in our world; in Jane and Vincent’s world, the coldmongers — who have a type of magic that can only make things colder (quite valuable in summer, useless in the winter) — are being blamed for 1816’s terrible and unprecedentedly cold weather, which adds yet another layer of complexity to an already challenging situation. Now, why are the coldmongers important? (Aside from their obvious fantasy value, that is.) Well, Jane’s much prettier (but talentless) sister Melody has finally found a good man — Alastar O’Brien, heir to Lord Stratton — but there are three problems with a potential match between them: One, Mr. O’Brien is Irish. Two, Mr. O’Brien is Roman Catholic. And three, Mr. O’Brien is well-known as one of the coldmongers’ strongest partisans . . . so when intrigue relating to the coldmongers causes him and the Vincents to be called into question later on, you can see where Melody’s marital aspirations might be impeded. The Irish, back in 1816, were not well thought of at all. Even though many Irish lords had roots that dated back to England, and had family in England, that didn’t matter. The Irish were only just becoming a part of what was starting to be known as the United Kingdom, and as such, they were not well understood and prejudice against them was high. And a big part of that prejudice was because most Irish were Roman Catholic. The Catholic religion was also not understood or appreciated, partly going back to what caused the Anglican church to split off in the first place: Henry VIII’s wish to annul his marriage to Catherine of Aragon not being granted by Pope Clement VII. (We tend to think of Henry VIII as “divorcing” his wives to remarry, but he actually had annulled many of his wives in order to marry the next.) The Catholic Church did not believe in Henry VIII’s sort of behavior, and as such, the Anglican Church and the Catholic Church were at great odds with each other — at least in principle. So the fact that Jane, who’s a kind-hearted woman, says ridiculously slanted things to Melody at first about her love, Alastar O’Brien, and only later learns how biased and prejudiced these things are is true to the spirit of the times. It shows just how much intolerance there was toward the Irish, even the Irish lords. And it shows just how difficult a “mixed” marriage between a Catholic Irish lordling and an Anglican well-bred miss could be, without preachiness or undue sentimentality. 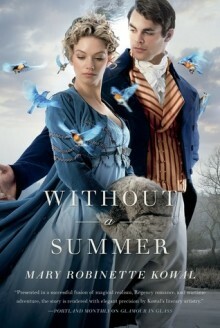 I enjoyed all of the romantic elements, the historical elements, and especially the fantasy elements of WITHOUT A SUMMER. But the standout moments here were the quietest, and had to do with the ongoing marriage between Jane and Vincent. These two love each other unreservedly, and with an understated but very real passion . . . that they both live and work together and enjoy it thoroughly is both a very modern touch, yet a very traditional one at the same time. And it’s also very, very hard to pull off, but Ms. Kowal does so with the greatest of aplomb. Ms. Kowal takes on some huge themes (prejudice, the problems of incorporating technology in a previously agriculturally based society, and needless and unrelenting cruelty coming from people who should love you, but just don’t for whatever reason) along with some more “minor” themes dealing with family relations, the problems a married couple faces when both of them work, and many more. But WITHOUT A SUMMER does not suffer for all of that — instead, it thrives. Bottom line? Don’t miss WITHOUT A SUMMER, as it mixes the best of romance with the best of alternate history, and comes out a major, major winner. As promised — it’s July 5, 2012, and Shiny Book Review is back. 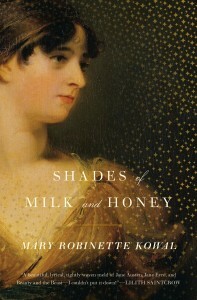 Now, on to tonight’s reviews, this time for Mary Robinette Kowal’s two alternate Regency fantasies, SHADES OF MILK AND HONEY, and GLAMOUR IN GLASS. Both novels are about Jane Ellsworth and the people around her, particularly her love interest, Mr. Vincent, and her sister, Melody, who plays a substantial role in the first book. The structure of SHADES OF MILK AND HONEY is very like that of Jane Austen’s novels (in particular, referencing PRIDE AND PREJUDICE); the main difference is with regards to the fantasy element, something called glamour that seems very like artwork and painting, except with the aether. When SHADES OF MILK AND HONEY starts, we find out that Jane feels like she is plain despite her strong talents with glamour. Jane’s talent is like a breath of fresh air, and she’s so good with her glamour that people with sense believe she’s an artist of a certain kind — or at least that she could be, with the right training because she has much talent. But her family doesn’t have the money to send her for advanced training; instead, they mostly seem to be trying to marry both her and her much prettier, younger (yet talentless) sister, Melody, off. SHADES OF MILK AND HONEY is at its best when Jane and Vincent are fully on stage, mostly because their dialogue is witty and sprightly. The fantasy element of glamour helps to keep the romance going, even though I called every single plot twist early on, mostly because I’ve read my Austen thoroughly. That’s not a weakness here, as this is definitely a novel that’s all about Jane’s journey from mild-mannered “plain” Jane to a young woman who’s actualized her entire self, from realizing her love for the difficult Vincent to accepting that her talent for glamour is strong enough for her to consider herself an artist — or at least consider the possibility that she may become an artist down the road if she sticks with Vincent and follows her heart. However, there’s a bit of a problem along the way; it seems that Jane is pregnant, which keeps her from using her talents for glamour as that’s known to harm the unborn child. Yet Vincent ends up overtaxed and in great distress; whatever will Jane do? And once she’s done it, what will she end up thinking about it? The main difference between SHADES OF MILK AND HONEY and GLAMOUR IN GLASS is this: the latter book is much more of an action-adventure story (granted, an action-adventure story written in the way Jane Austen might have written it, with period dialect and mores intact). That keeps GLAMOUR IN GLASS moving along nicely. 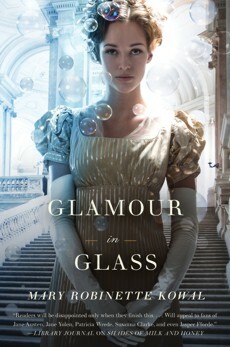 Of course, as this is an alternate Regency, that means Napoleon’s fate isn’t exactly the same in GLAMOUR IN GLASS as it was in our world, but I enjoyed the different spin Kowal put on it and believed that it made sense in the context of her novel. Overall, both books read well and quickly, especially if you’ve read any Jane Austen before or have read any of the Austen pastiches (including Sarah A. Hoyt and Sofie Skapski’s excellent A TOUCH OF NIGHT). 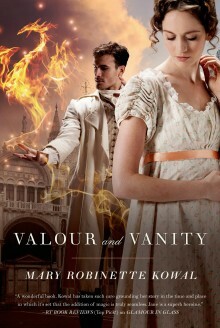 Kowal’s writing skills are superb and she understands the Regency milieu well, which is why both books were a pleasure to read. Bottom line: if you love Jane Austen, alternate Regencies (such as the André Norton/Rosemary Edghill CAROLUS REX series), or just plain good writing, you should buy both of these books as soon as you can. Because they really are fantastic. SHADES OF MILK AND HONEY — A.
GLAMOUR IN GLASS — A.